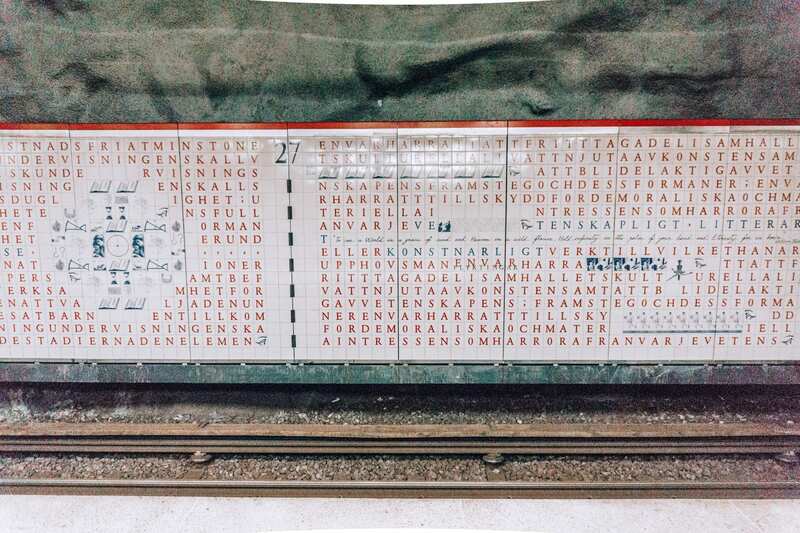 The Ultimate Super Detailed Guide to Stockholm's Subway Art (Maps included!) | The Atlas Edit. Home to IKEA, H&M and some more huge household names, and next-door-neighbors to the “happiest people in the world”, I had always been intrigued by Sweden. 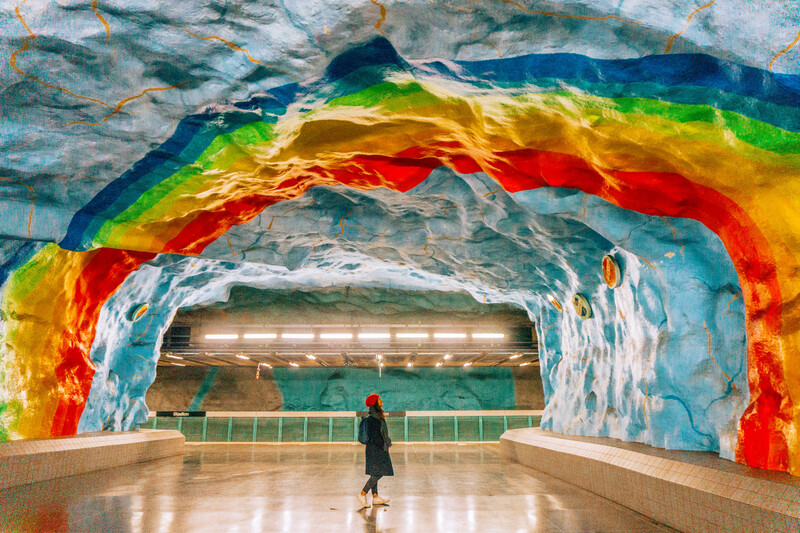 There’s no doubt that Stockholm is an absolutely stunning city above ground, but did you know that the longest art exhibition in the world, at 110km lies in Stockholm’s Subway System underground? And you can do this all in just under two hours, and is great especially for escaping the blistering cold outside! The Stockholm subway system is really efficient and easy for commuters so it can totally be done on your own, however, there are guided tours available if you’d like to learn more about the history of the stations or if you just prefer to follow along without having to depend on Google Maps! 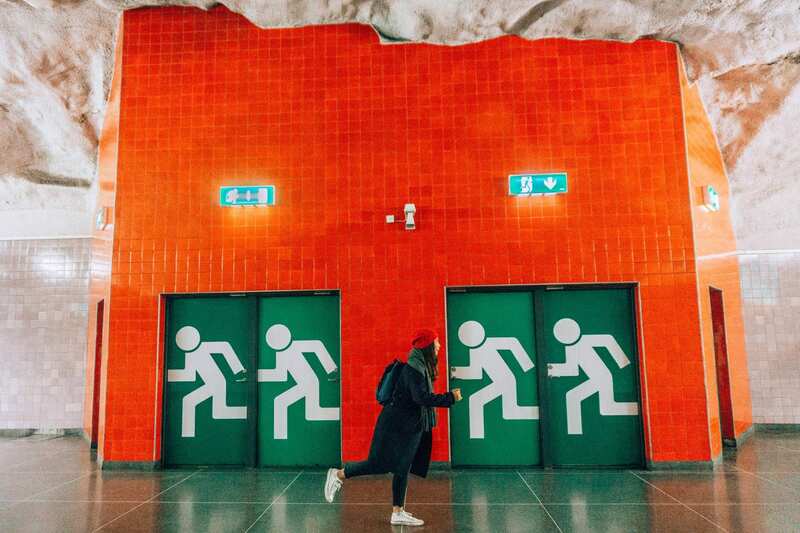 Whichever way you choose, you’re going to love Stockholm’s subway art! I personally did this self-guided tour which I have now compiled into this guide, covering 9 amazing stations complete with a map of the subway. If you’re planning a trip to Stockholm, read my indepth Stockholm for First-Timers Guide: Things to Do, Itinerary and Travel Tips. There are a few options for tickets, depending on how long you will be visiting Stockholm. You can get tickets that are valid for either 75 minutes, 24 or 72 hours. 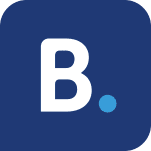 You can purchase a single journey ticket for unlimited travel within 75 minutes. I actually managed to finish doing this tour in exactly 75 minutes, though I was on the 72-hour pass so I wasn’t really in a rush. But this will differ based on the day and time you’re doing it, how crowded the stations get, how long you’ll need to get the shot you want, etc. Or you might even like a particular station a lot more and want to spend more time there! If you are staying in Stockholm for a few days, I’d recommend at least the 24-hour or 72-hour pass, which is valid on buses, trains and even ferries. 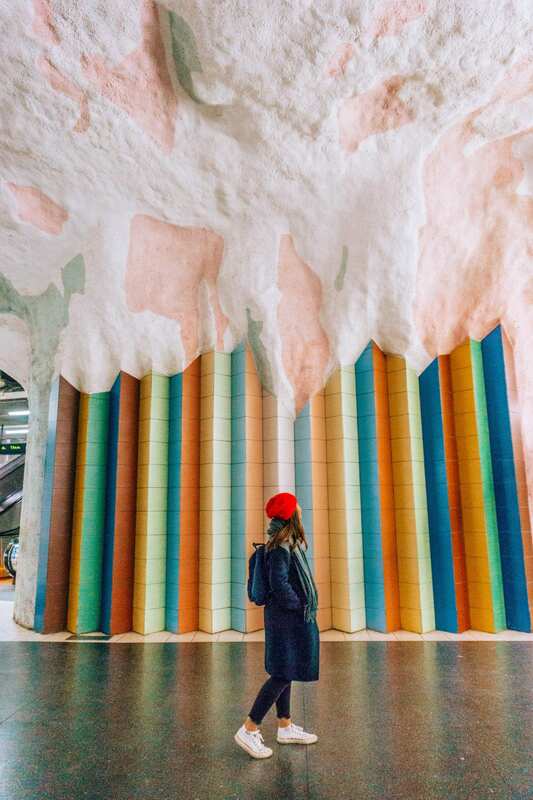 You’ll probably be exploring the rest of Stockholm too, besides seeing the stations on the Stockholm subway art tour, so this might be more bang for your buck. For added convenience, you can purchase an SL Access Card, called a rekassa in Swedish, which is a rechargeable electronic smart card, similar to the Oyster card in London. *Only available with an SL Access card. 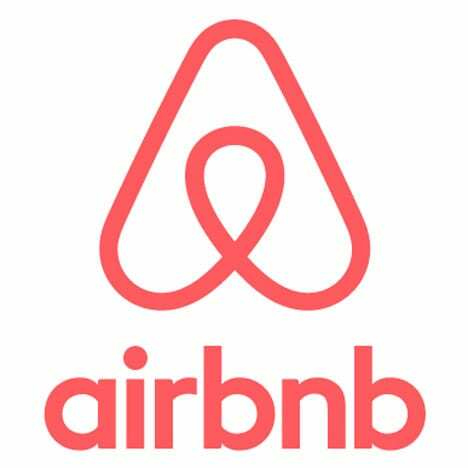 Prices are accurate as of January 31 2019. For updated prices, check out Stockholm’s transport website. Since the stations are underground (with the exception of Thorildspan Station! ), there is absolutely no natural light. With only fluorescent lights as the only source of light in the stations, this can make for a pretty tricky situation. You definitely can take some decent shots with your phone camera, but if possible, I highly recommend using a DSLR so you have the option of shooting with longer exposures. I used my trusty ol’ Sony A6000 which served me well! Either have a very steady hand or make sure you pack your tripod (which I regrettably forgot!). In fact, don’t forget to take some Boomerangs! Stockholm’s subway system is super easy to navigate, and the lines are color-coded: red, green and blue. Each line basically runs back and forth on their respective track, so as long as you’re on the correct platform, you should be good. Some lines split off at some stations, but I will tell you which trains to look out for. The three lines intersect at the city’s main train station, T-Centralen, which is a great starting point for your tour. A few tips before we start off on our journey! If you’re asking around for the trains, you’ll wanna know they are known as the T-Bana, or tunnelbana, which in Swedish means tunnel railway. Of course, this is an actual commuter subway so it can get pretty crowded at times. Avoid rush hour, which is generally until 9am in the mornings, and starts up again at around 4pm. I did this tour on a Sunday at 1.30pm and had most of the stations to myself, except the main station, T-Centralen of course. The stations get a lot quieter the further away you are from the city. The trains run pretty frequently, and you can always check the times of the next train on the displays above the platform. Most trains run every 5 or so minutes, so you can time your visits accordingly. Trains do make longer stops at certain stations, which gives you enough time to hop off to take some quick shots, and then hop back on before the doors close. Do so at your own risk though! I recommend traveling all the way to the last station in the line that you’re interested in seeing, and then making your stops on the way back to the main station. I found that there were a lot less people this way. Okay, now that we’ve got all that out of the way, let’s begin our tour! Note: Obviously, you can start on any line you prefer, so feel free to swap them around based on your location and preference! If you’re starting from T-Centralen, head to the platform for the Blue Line. You’ll know you’re in the right place because you’ll start to see blue murals all over the ceilings. On the top floor, you will see blue paintings of workers on the ceiling. 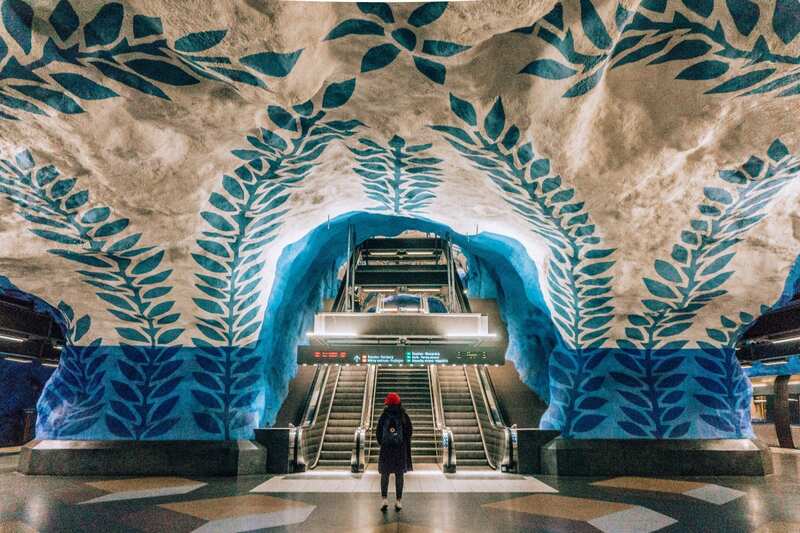 Once you take the escalators down to the platform, you will be greeted by a beautiful blue leaf pattern painted all over the ceilings and walls. Take the blue line and hop on the train headed to Viksjö. Make sure you get on the correct train as the blue line headed west splits off at Västra skogen. Take it all the way to Hallonbergen station, which is the 7th stop from T-Centralen. Imagine letting your kids run wild in a train station and doodling all over the walls, and there you have Hallonbergen station! Take the train back in the direction of T-Centralen and hop off at the next station, Solna Centrum. Painted in vivid orange and green, Solna Centrum’s art depicts the country’s rural depopulation, the destruction of the environment, forests and nature. All the paintings tell a different story, so definitely stick around and have a look at all of them. Now, hop on the next train in the direction of T-Centralen again and get off at Fridhemsplan. Here, you will swap over to the Green Line. 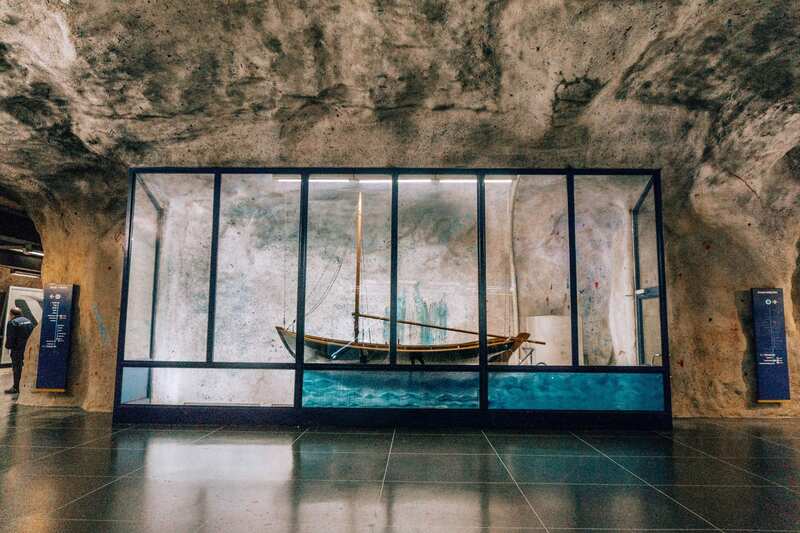 While waiting for your train, you’ll spot a pretty cool model of a Viking ship sitting in a glass display. Pretty random for a subway station, eh? But if you’re short on time, I would probably skip exploring this station and just use it as a base to swap over to the green line, as it isn’t as interesting as the other stations. Take the train in the direction of Hässelby strand or Åkeshov, it doesn’t matter as we’ll be getting off at the next stop and both trains will stop there. 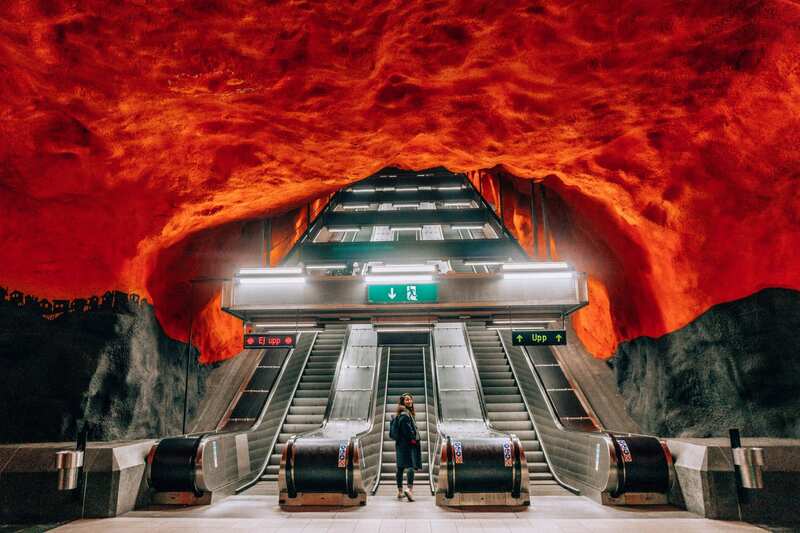 Get off at Thorildsplan, and here you will realize you are no longer underground! If it’s cold out, now would be the time to put on your coats! This was one of the cutest stations I’d ever seen, and kept me smiling the whole time! I mean, Mario and Pac-man dude! Talk about nostalgia. 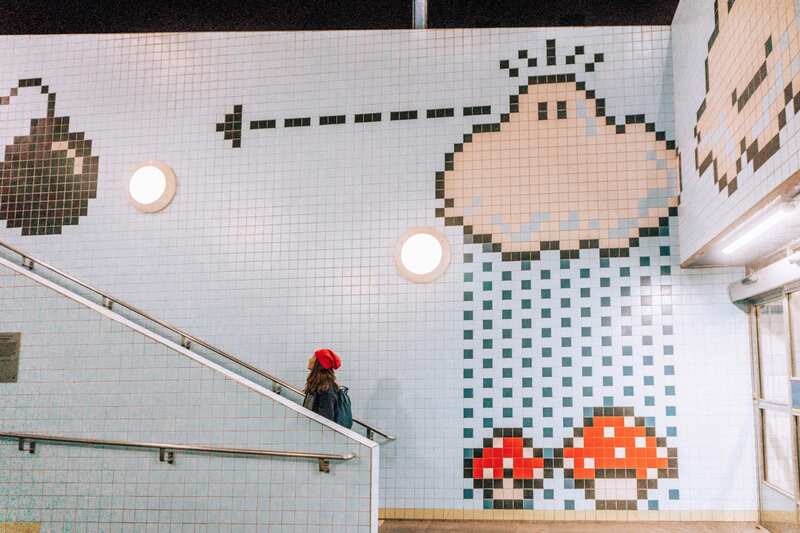 I just love how much creativity they put into something as common as their subways! Now, take the train all the way back to T-Centralen, and head to the platforms on the Red Line. Once you’re at T-Centralen, take the train in the direction of Arninge and ride 6 stops to Morby Centrum. Such a cute wall, and another one of my favorites! It reminded me of a little popcorn rainbow cloud, if that even makes sense! Then, take the train back in the opposite direction towards T-Centralen and ride 3 stops to Universitetet. I love this play on the exit sign, and makes for such an eye-catching piece too! Sometimes you gotta go against the crowd, hey? There’s educational installations all around the walls so be sure to check all of them out! Head in the same direction and get off right at the next stop at Teksniska högskolan. Travel towards the same direction and get off on the next stop, Stadion, and be prepared to be wowed!!! This was my absolute favorite station, and there’s no wonder why. 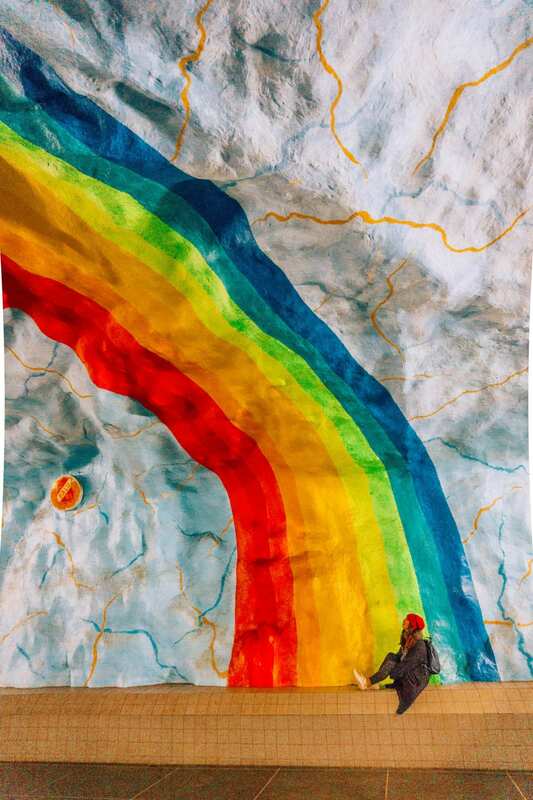 Always wanted to sit under a rainbow? Well, consider that off your bucket list! I couldn’t help myself from smiling the whole time I was here, and I probably spent the most amount of time at this station! I mean, look how pretty?! Don’t forget to take a walk around the station though as there are more rainbow signs around. And that’s our last stop on our Stockholm Subway Art Tour! And what an awesome way to end it – under a rainbow! 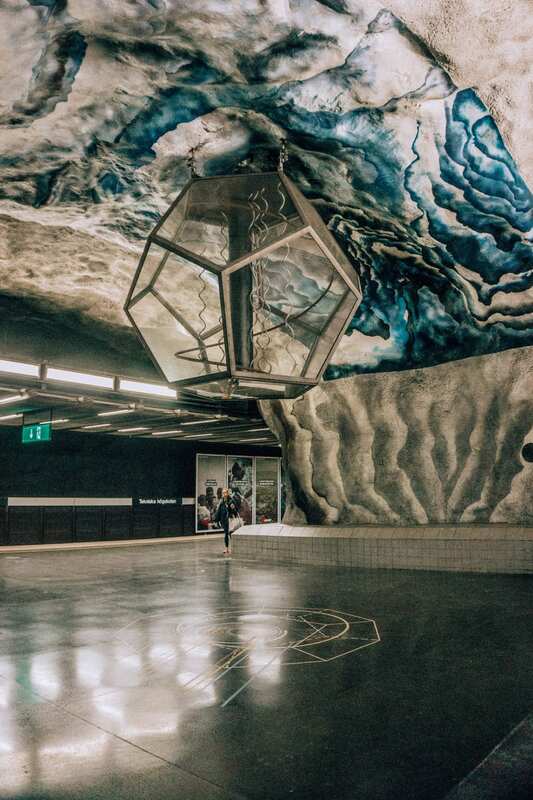 I hope you enjoyed this guide, and I hope it helps you plan your own little tour around Stockholm’s subway stations and makes riding the subway that much more enjoyable! If you’re planning a trip to Stockholm, read my in-depth Stockholm for First-Timers Guide: Things to Do, Itinerary and Travel Tips. This is such a great guide! You included so many that I’ve never seen before! I love how they have tour of all them now. I’ll definitely use this for my next trip to Stockholm! Perfect itinerary. I’ve been looking around for some guides over Stockholm Metro Stations tour.. Thank you!